Summary: Darkness seems to seep out of the core of the Earth when multiple earthquakes occur along the west coast of North America infecting people’s minds and hearts with evil, causing them to do horrific things. As a result, the lives of Mason, Clementine, Ariel, and Michael are forever changed, and one by one they decide to make their way to Vancouver to start over. In this new world, electricity is out, the phone lines are down and society as it was previously known has been decimated. Those who give in to the evil inside are known as Baggers, willing to kill or collect anyone they come across, but those who seem able to fight the darkness may only be able to do so for a time. Now, no one can be trusted. Review: Guaranteed to give you chills and keep you up at night, Dark Inside by Jeyn Roberts is a sophisticated read as Roberts weaves together a tale of horror that comes from the inside. There is no clear explain for why people become Baggers, only that they seem to be opened to the evilness that already lurks within them. I read on Roberts’ Goodreads website that the series is based on nightmares she used to have as a teenager, noting there is nothing more scary than zombie-type beings who keep their intelligence. She’s right. With four main characters as well as several secondary characters, it was a bit difficult to keep track of everyone’s individual story. I did confuse Mason with Michael sometimes, and found things a lot easier when everyone came together. The first time I read Dark Inside, I was carried along by adrenaline and suspense, missing a couple of important details along the way. The second time though, I picked up a couple of key points, such as clues to the identity of Nothing. While I was most intrigued by Nothing’s perspective and internal battle against the evil that overwhelms, Chee, or Chickadee, was my favourite character. Though the earthquakes affected her in serious ways, she seemed able to hold herself about the darkness that affected others. And when she went, I was sad, but also happy that Mason stayed with her. But most of all I liked the complicatedness of Daniel and Mason. Daniel claims he’s dangerous, yet keeps doing good things by rescuing Ariel more than once. Mason appears good, but loses his nerve when people need him the most. He feels a draw to evil inside him, except he still stays with Chee in her time of need. 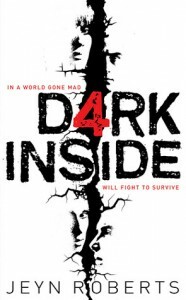 While a satisfying read in its own right, Dark Inside still leaves unanswered questions for its sequel, such as, what do they do now? And, what is the end game of the Baggers? There’s no question, I’m hooked, and after reading the sequel, Rage Within, as well I cannot wait to read the finale when it comes out. “The evil that infects up has always been around. Since the dawn of time, before names could be named, before words were written down – they have always existed. There are no records because they leave behind no trace. How do you chronicle something you cannot see? Once upon a time an ancient civilization grew. It prospered. The people were happy and intelligent. They created cities and erected great monuments. But something always happened. They grew greedy, perhaps, or maybe they took more than the earth was willing to offer. And that’s when their downfall began. The darkness that lies beneath started to stir. 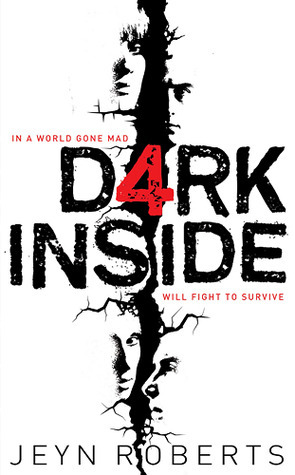 Dark Inside by Jeyn Roberts, is published by Simon and Schuster Canada, (2011).